Bitten Toast Games have seemingly been looking at the gaming markets as a whole and looking for games within said market that they could try to create a title like no other and release it upon the world. The finished product ending up being What The Box. A game that blends both multiplayer action, with a slight surprising use of stealth, and wrapping it all into one package of pure sillyness. So is this title worth your time or more like WTF? 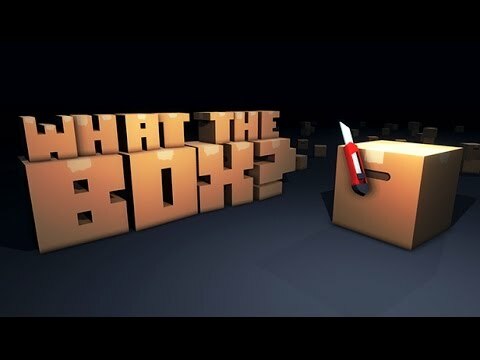 What the Box is a very simple multiplayer shooter, it doesn’t offer anything in real terms of gameplay if you are coming into this as a person looking for single player action apart from various fights with bots. 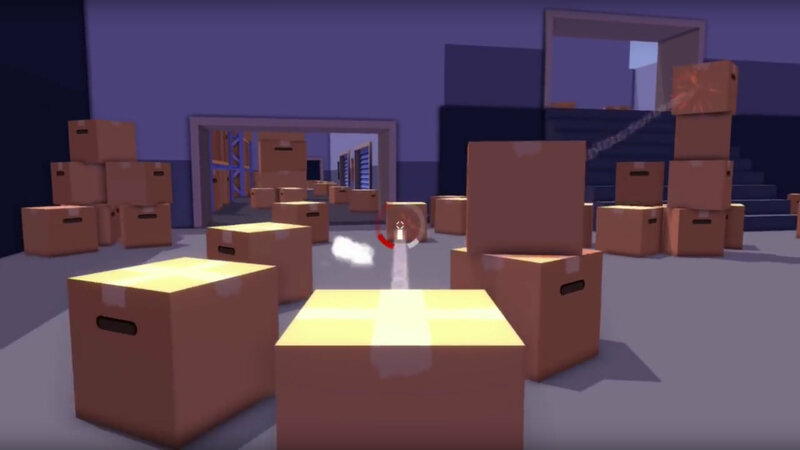 You’re character is a cardboard box, and it is your mission spread over the course of six different game modes to try to eliminate as many other boxes as you can, whilst you try to win for your team, collect the packaging tape, or become king of the boxes. Each persons character looks identical and each brandishes two separate weapons, one being a staple gun and the other being a box cutter Both weapons have their strengths and weaknesses, the gun can shoot from afar but only holds three rounds before you need to reload. Whilst the box cutter can offer up simple one hit kills as long as you can become skilled enough to get in close, aim and attack before you get shot down for the effort. If you do take some damage though you can always find a quiet place to just sit it out for a few seconds, as whilst you sit you look identical to every other spare box that is randomly generated onto the map, which makes it perfect for you to also stalk out your prey whilst you regain some health. See health only regenerates when you sit perfectly still for a couple of seconds. This also includes if you try to scour the view and watch enemies, technically your box is moving and thus you can’t regen that lost health. As previously stated the game offers up six different modes and each are modes that you can find in other multiplayer games of the same ilk. Apart from this time some are slightly adapted to match with the box theme. You get modes like your standard death match tropes, and we get a capture the flag type game which sees you running after parcel tape. One of the modes I did kind of enjoy however was the juggerbox mode which sees you become an instant target to the rest of the map if you kill the previous juggerbox, but with the target on your back, you become slightly more stronger and can absorb slightly more damage than everyone else on the field. All in all what the game offers is easily enough to keep you occupied for the short bursts of time you would probably expect yourself to be playing this title. Which one is my enemy? When you first load the game and get to the menu, you will immediately be greeted by one of the very weird and wacky songs produced for What the Box. Each stage in fact within the game comes with its own unique theme, and whilst some of the songs can be quite catchy, they can also grow tiresome very quickly. The snow level features a very festive tune, but it loops on a pretty quick basis meaning within one five minute game, you will have heard the same section of song about eight times or so. Apart from the music within the game though which is pretty good in small doses, the rest of the games sound design is a little on the sparse side, you get sound effects for wielding your knife every time you try to cut open another box, and each time you fire the staple gun you get a short sound effect. If you manage to kill another box though which in fairness aren’t too difficult you will be met with a very wondrous noise of a box either being crumpled or exploded. What is here does the job for a small indie title at a budget price, but don’t come away expecting to remember anything sound wise an hour after play. Best summed up as simple yet effective, for once in a multiplayer shooter you won’t be seeing various players running around in a million and one skins, as the whole point to What the Box is that you blend in to the surroundings and look identical to every other player. Because everyone plays as a simple box design you never know if a box just a couple of strides ahead of you is actually an enemy in disguise waiting patiently and sitting as still as can be so that they can jump out and attack you. Whilst I enjoyed this concept at a graphical standpoint, I was however let down by the fact that if an enemy is brandishing the box cutter at that moment, the cutter actually shows and gives away their position. The game itself though is rather colourful and with the six different level designs, each offers something a little different to the last. None of the levels are rather big and for the amount of players the game can hold you wouldn’t expect them to be. But with each one offering up different vantage points for players to utilize, you can see that each map had some planning go into it. Finally the games presentation, everything from the initial front end menu design to the pause menu, really bring the side down, these are really bare bones and sometimes just functional at best is the best way to put it. If you try to navigate using the analogue sticks you may end up selecting something completely different to what you expected. What the Box’s difficulty is essentially what you make it, aimed at being a purely multiplayer shoot em up, if you play with friends or find a game online, then it will come down to how much skill you have got and how you can preserve and hide your box whilst your health regenerates. Usually it takes between three to four shots to take down another enemy box, so sometimes it may be worth waiting for another player to deal some damage first before running in and trying to steal said kill, instead of gung hoing it from the start. If you decide to play against bots however, then expect a rather substantially easier time, sometimes the AI will get the better of you with a few well placed shots, but it is never anything too strenuous and sometimes the AI will help you out by accidentally getting itself killed on some of the level hazards. Anybody who Is mildly good at online shooting games should find this game pretty easy to pick up and play, but non shooter fans probably won’t have any opinion on this. With no perks or extras to unlock it is essentially who can aim fastest and most accurate that will get the kills. The achievements for What the Box is where the game really seems to shine the most, not to take away from the main game that is, but whilst some of the achievements are rather easy to obtain, the achievement descriptions are some of the funniest we have seen in some time. Achievements ranging for killing a certain amount of box’s to even gaining the Metal Gear solid related achievement for dying once are easy gimmie achievements. You also get achievements for winning on each of the various modes as well as winning a set amount of games on said modes. Nothing here is too hard to tackle and will likely take the most achievement hunters just a few hours to obtain everything, its just a shame that the most grindiest achievements come from winning five games of each mode, seeing as the lowest time limit for each mode is five minutes, you can expect to be in for a wait as you idle most of the time away. What the Box isn’t a title that takes itself seriously in any way shape or form, it is a title that set out it’s own little niche in an already stacked gaming calendar and because of that, it is bound to get way more noticed than say another other shooter trying to do what other shooters on the market try to do. From its cutesy box art style, to how the game plays really simply for that pick up and play mentality, What the Box is a game that most people should own for their console especially at the low price it launched at. The game won’t have the staying power of any of the bigger named titles on the marketplace purely because their isn’t much to keep you coming back unless you like killing endless boxes, but if the multiplayer is to die up, then at least you can either play with friends or against the AI.